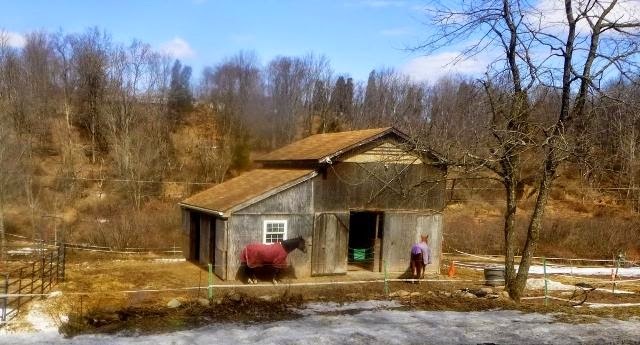 Even the horses, still with their winter blankets, are wondering when spring will finally arrive. Photo compliments of Nigel G.
According to the calendar, it was a spring event, but it definitely still felt like winter, as the 25 riders will attest to. Temperatures were below freezing at the start, and never made it out of the 30F's. Gusty winds out of the northwest made it feel much colder all along the leg from Wind Gap to Little Gap. Last December's ride was balmy in comparison. Despite the very chilly conditions, all 25 riders made it to the finish for a 100% completion -- congratulations and well done to all! First finisher Ed B. writes: "...Thank you (and Eoghan) for a wonderful 200k... Yesterday was hard. The first 70 or so miles into a 20+ mph wind with 25-28F temperatures froze my one lone container of "emergency use only" Goo solid and the fact that I reached for that vile "food" and that it was rock solid says it all. The Blue Mountain is one of my favorite rides because it has everything a rider could want and despite the challenging conditions, it was perfect. It has two good manageable climbs, lots of rollers, flat sections, rivers, valleys that are all wrapped up in quiet, low volume country roads with spectacular scenery. Nice riders. Finishing up at the Ship Inn with others was a treat and a perfect personal celebration marking my 1 year anniversary of returning to randonneuring..."
Jim H. writes: "...This was one of those rides that I was very glad to be finished with. Needless to say, it was a cold one, especially before the Blue Mountain crossing. Not long after that crossing, I began to feel flat on the bike .... But, as always, thanks to you and Eoghan for another great ride; and to Pat and Cecilie for their scouting report. A challenging course, terrific mountain and river views, great riding companions and excellent brew and chew at the finishing controle..."
Nigel G. writes: "...Thank to you and Eoghan for putting on this ride. I've grown quite fond of this particular route and yesterday's quiet roads and bucolic setting did not disappoint. The wind and the cold on the other hand, certainly upped the ante...Spending four hours riding uphill into a freezing headwind gives you lots of time to question your decisions ...."
Eric K. writes: "... I must have been so excited to ride my first 200k since October that I didn't feel that the headwinds were too bad. We did run into a few tough stretches -- one before Phillipsburg, and then the approach to Wind Gap. But I guess that's why the call it Wind Gap. We seemingly had tailwinds on both stretches paralleling Blue Mountain, which was a welcome surprise. I was concerned that I was under-gloved, but I didn't have serious hand freezing issues until the end. Overall, I like the course a lot, and the change involving Turkey Hill was very nice. Other than being cold and windy, the weather cooperated. On the way in from State College, I hit quite a bit of snow. It must have veered north..."
Tim C. writes: "...Thanks to you and the rest of the PA randos for organizing this. It was a very pretty ride, and the weather held out. That wind was terrible for the first part, but the ride from the ski resort to Water Gap made up for it. I stopped at that bakery on my way out of the park a year and a half ago with my touring bike, tent, and supplies. I was pleasantly surprised when I pulled up to it, and the other riders who were there got an earful about how I had been there before. That's a great place for a controlle...."
Rudi M. writes: "... I was very impressed by the route; the many beautiful roads, near perfect cue sheet, friendly controle people, and so on, all really great..."
Special thanks to organizer, Eoghan B. for sending the riders on their way at the start and greeting them at the Ship Inn finish. Thanks also, to volunteer preriders Cecilie and Patrick G. for their course checkout. And thanks also, to Bill O., Chris N. and Chris' dad for helping to greet all the riders at the Ship Inn finish with a warm welcome after a very chilly ride. Anyone interested in splitting a room for the Friday night before the 300?